I've turned into a traveling wuss, I guess. That place in Palm Springs ruined me. 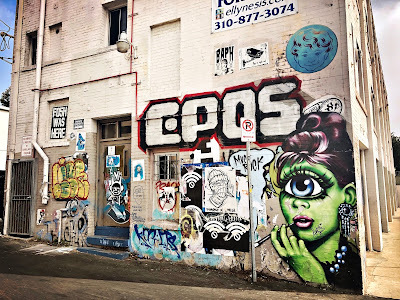 I drove to L.A. in the morning and got to my hotel just after noon. When I got here, they told me my room would not be ready until four, so I put on my walking shoes, grabbed my camera(s), and set off. L.A. is a dirty city, at least the parts I've seen so far which have been downtown from the highway and walking though Venice Beach and environs. A sea haze hung over the town yesterday, warm and wet, which did nothing to make me wish I hadn't stayed in Palm Springs longer. But I was here, and I was out. I walked to the Venice Pier which was absolutely nothing, then down the beach toward Santa Monica. Characters and tourists. Being crazy and poor does not make one photogenic, and to that end, my photo walk was uninspiring. 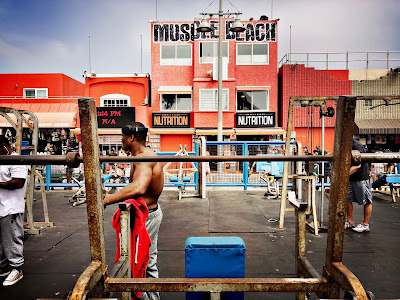 A crowd was gathered around the famous Muscle Beach Gym, an outdoor facility with rusted equipment and rusted bars that has inspired prisons everywhere. You can get a pass to work out there for $10/day. I wasn't interested. What attracted the crowd was three tatted brothers who were performing some handstands on one another. I took a few pictures and moved on. Further down the boardwalk, I came upon another crowd and went to investigate. It was a skateboard park. In my head, I picture SoCal as blonde headed white kids on skateboards, but that is not the case. Asians, Mexicans, and African-Americans. Well, I haven't been here for a long, long time. I wandered further until the crowd had thinned, and as I was tired, I turned away from the beach and walked toward a street chi-chi of shops. I stopped at the first restaurant I came to that had customers, a Mexican place where I ate two fish tacos and drank a cold Corona. I knew the beer would make me sleepy, but I was already feeling beat. 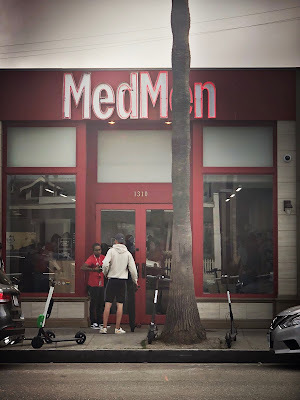 I texted a friend and told her that I smelled marijuana everywhere but had not yet seen a dispensary. Weird, I said. There must be more to it than we think. Within a block, however. . . .
Well. . . I walked in. The shop was full of guys in red shirts, the security squad, just about one per customer. Prices must be high to pay for them, I thought. To get in, you had to set up an account. I gave them my drivers license and became, I assume, part of the FBIs permanent record. The place smelled like a grow house and was overwhelming. Hundreds of products, it seemed, cookies, gummies, oils, vapes, and just plain bud, all ranked and rated for what they did or could do. I thought about the kids in my own home state who pay tens of thousands of dollars on legal fees for getting popped for a joint. It just ain't NORML. After walking the streets all day, I was pooped and didn't want to walk any more, so I picked up one of the scooters that line the streets everywhere. Pretty cool. You download the app, then scan the code on the scooter, and away you go. I am not sure how much it costs per block or mile. I just put twenty dollars on my account and will see how far that takes me. But the damn things are squirrely. At least for a man my age. I took off all stiff and rigid waiting for my tumble. Weren't people getting killed on these? No helmet, nothing? But it was cool. When I got to my hotel, I just leaned it against a wall and left it. I hope that was the right thing to do. I got my key and took my bags to my room. And I was depressed. My place isn't a dive, but it used to be. My room is very large and has cathedral ceilings, but that is all. The carpet is hotel carpet, the furnishing are hotel furnishings. I am on the fourth floor and have a balcony, but it looks out over a parking lot. In the gloomy distance, I can see the mountains surrounding the bay. The isolation and the furnishings and the view and the gloom here are a stark contrast to the cheery Palm Springs room that overlooked the pool. My heart sunk at the thought of four nights. I did some quick Google maps routes to places I want to go. Ten miles. 1hr 30 min. Everything. Everywhere. It felt like lockdown. I decided to Uber to the Santa Monica Pier. I missed sunset which I thought would have been beautiful with both natural and artificial light, but that is what I got for moping around my hotel room. But I am a sucker and a sap for these old sights, and the Santa Monica Pier revived me in some primitive way. It is nothing. It is something. 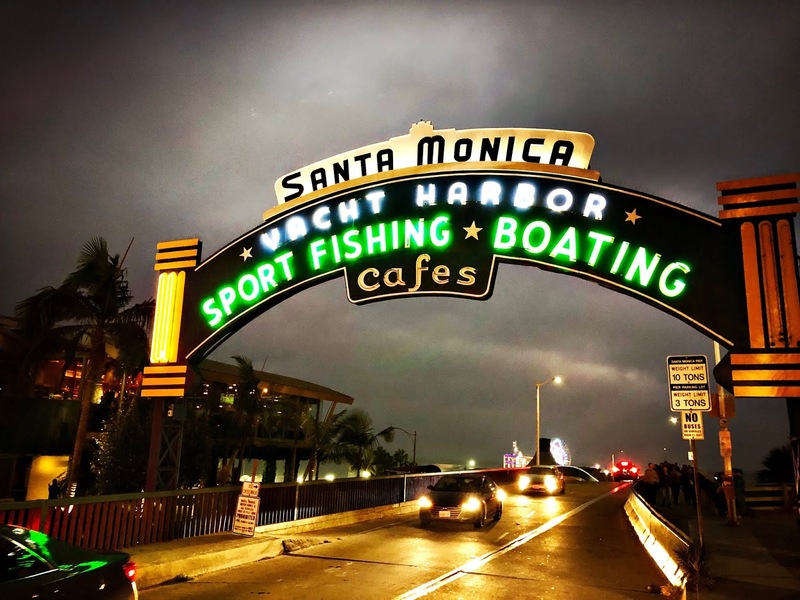 The pier is lined with happy hoi-poloi taking selfies and eating carnival food and lining up in front of the End of Route 66 sign in order to have their pictures taken. I tried to photograph, but it was dark. Occasionally, if someone was standing in the light, I got a photo that wasn't blurred and smeared, but mostly I was stuck with photographing the lighted rides. 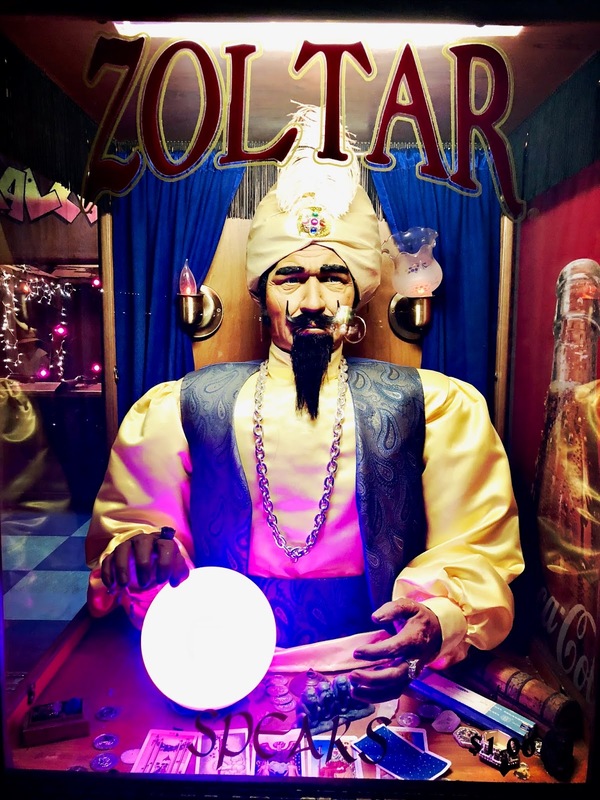 I was tempted to have Zoltar tell me my future, but I was afraid of how that would turn out. By nine, I was wiped, so I got another Uber back to the old hotel. I hadn't eaten and knew I should, but I was too tired to go looking for restaurants, so I went to the crowded Mexican place next door. Yep, fish tacos and a beer. The place was like any TGI Friday kind of place you could go. I sat at a sticky bar with three t.v.s showing the UCLA/Colorado game, staring into a bright beer sign listening to loud music I couldn't begin to identify other than it is the kind of stuff these people listen to. It was pretty miserable. I came back to the room and had a couple scotches. I had lost my bliss somewhere. I felt lost. I lay in bed and remembered vividly my trip around the country after college. I remembered being alone on the road staying in dumps, eating bad food. But I was looking for adventure, and there was a girl back home. Last night, I was looking for something nice, and back home there was only home. This morning I have lingered not wanting to begin the day, but the sun has come out and the day is, in some way, beckoning. I will go into it and see. As my one-time-friend said, "Don't be negative. Make the most of it."